Bank Reconciliation is specifically designed for the purpose of reconciling your bank statement with the information in Aplos. Here is how you would go about completing a Bank Reconciliation. You can watch the video below to see it in action or see the step-by-step instructions below. 1. Access your Bank Reconciliation: Fund Accounting > Transactions > Bank Reconciliation. 2. Pick which Cash account you’ll be reconciling. The opening balance will remain 0.00 for your FIRST Bank Reconciliation. 3. The opening balance will be automatically calculated for all following reconciliations. 4. Select the statement ending date. For instance if you’re looking at a bank statement that ends on 5/31, then select that as the ending date. 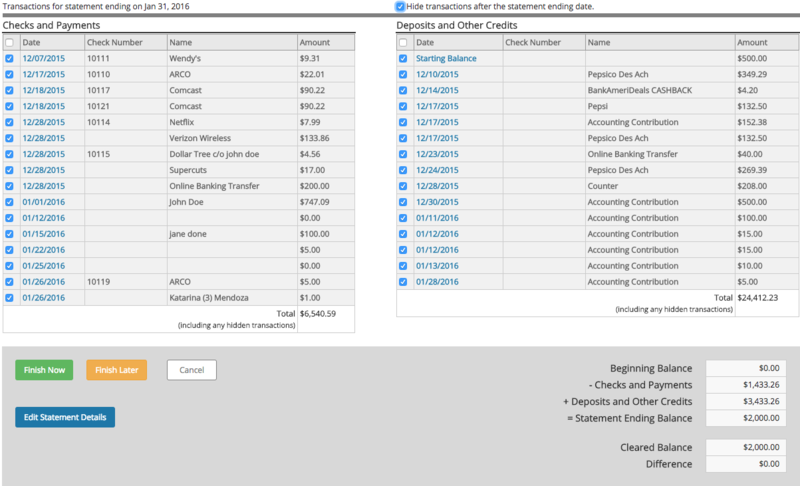 The transactions shown on the next screen are the entries you’ve entered into Aplos. On the bottom right of the screen you will see your Beginning Balance, and then Checks and Payments, Deposits and Other Credits, and your Statement Ending Balance. As you click through the transactions you will be marking the payments and deposits as cleared, with the goal being to arrive at your Statement Ending Balance. Here are the steps on how to proceed once you’ve set your ending date and balance (picture below). The best way to go about this is to print a bank statement for the period you’re reconciling, get a highlighter and pen, and follow the steps below. 1. Check which transactions show on your bank’s statement. Basically, just go down the list. If something appears on your bank statement and on Aplos, check the box next to the transaction and then cross it off your paper bank statement. If this is your first reconciliation, you’ll also need to check off your starting balances. As you check things off you’ll notice that the difference either increases or decreases. In order to finish and complete a bank reconciliation, the difference must be 0.00. 2. If you find a transaction that does not appear on the statement or in the software, you’ll want to highlight it and do some further research. It’s possible something cleared your bank that was never entered in Aplos, or something was entered in Aplos that never cleared your bank. You can select Finish Later if you need to come back at another time, or Edit Statement Details if you need to change the statement ending date or balance. 3. Once you’re finished, click Finish Now to complete your first Bank Reconciliation. 5. If at some point down the road you need to make changes to your reconciliation, you can click the “Re-open this Rec” button to edit details of the reconciliation or transactions. Congratulations! You’ve now finished your first Bank Reconciliation. Again, this process is very important and should be done often. For most organizations this is a monthly process, but that could vary depending on your needs.